The dubstep producer reveals he has schizophrenia & bipolar disorder. Despite affecting a huge number of people, discussions around mental health remain taboo in the entertainment industry. Unstable lifestyles and hectic touring schedules can severely take their toll on an artist’s mental well-being, but it's rarely talked about. 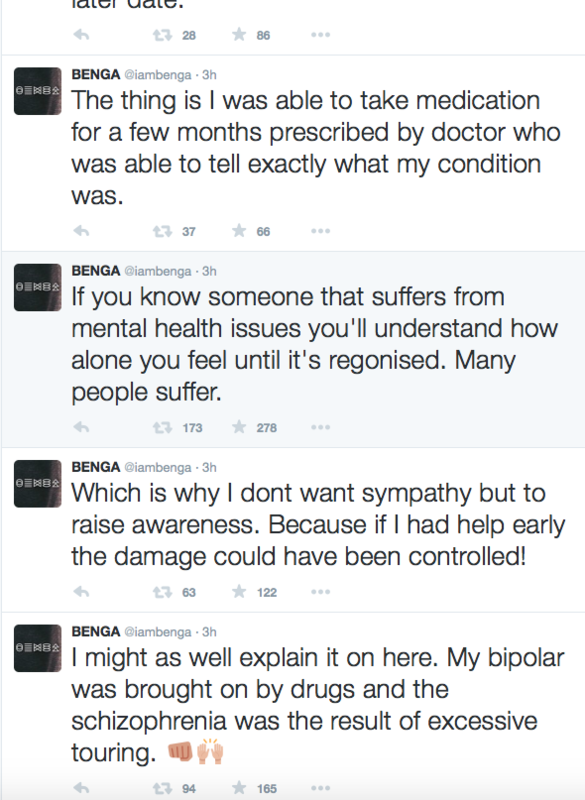 Now, Croydon producer Benga has just spoken out about his experiences on Twitter, explaining that he suffers from schizophrenia and bipolar disorder, while encouraging people in the same position to seek help. The dubstep pioneer has said that he does not “want sympathy”, and has also taken the opportunity to thank his peers Skream and Artwork for their support. "My bipolar was brought on by drugs and the schizophrenia was the result of excessive touring," said the producer, via Twitter. The ‘Diary Of An Afro Warrior’ producer has also stated that he was sectioned at one point. Hopefully these actions inspire others around him to do the same. “The stigma around it is what makes you so alone.... Nobody recognises it,” he continued. Preach! Head here to read all of the tweets.